MISSION ESL COMPUTER LAB: "Underground Adventure" from Edcon Publishing. "Underground Adventure" from Edcon Publishing. Anne and Jack hope that help will come soon. Something you will read about. Limestone. A type of rock. Anne and Jack were almost too excited to eat breakfast. This was the day they were to explore a cave about forty miles away. They had visited a famous cave last year. Today's expedition would be entirely different, Dad told them. He said that they should be prepared to rough it. Everyone hurried, and soon they were on their way. Near the cave, Dad stopped the car to pick up Jim, the guide he had hired. Jim got into the car, bringing with him special supplies they would need for their expedition. Because it was summer, the air in the cave would be cooler than the air outside. In winter, the opposite was true. 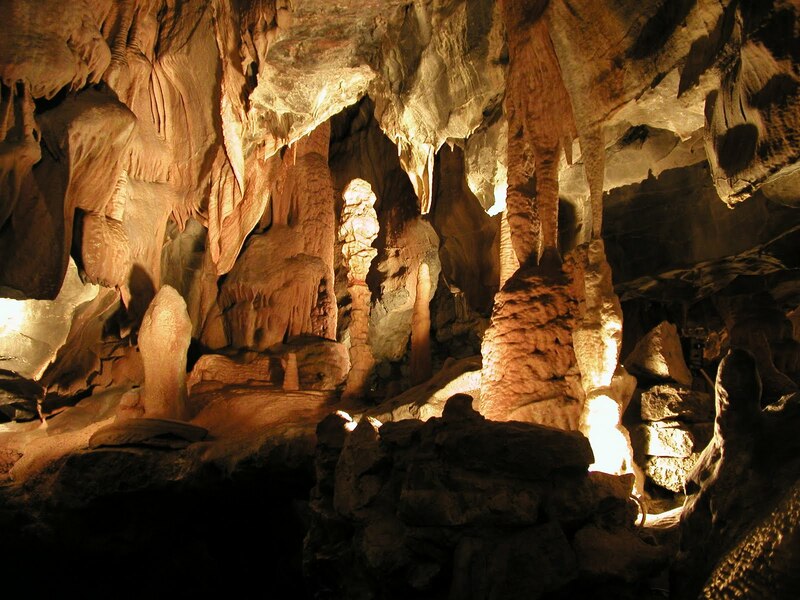 The temperature inside the cave remained almost the same during the entire year. Their state had over a thousand caves. This was one of the smaller ones. It did not attract the number of visitors that the larger ones did. When they reached the cave, they put on raincoats, hats, and boots in order to remain dry. Jim entered the cave, followed by Dad and the children. Several bats that had been resting inside were disturbed and started flying around. Everyone was startled except the guide. Bats often live in caves, and Jim was used to them. They walked through several rooms. Then they crawled through a tunnel. It was difficult crawling and carrying things at the same time. The children couldn't help wondering where all this was leading. Jim had purposely not mentioned that this tunnel would connect with the most interesting chamber of the cave. Before long, they all stood in an enormous room. Jim shone his special light. He explained that this chamber had been formed over thousands of years. 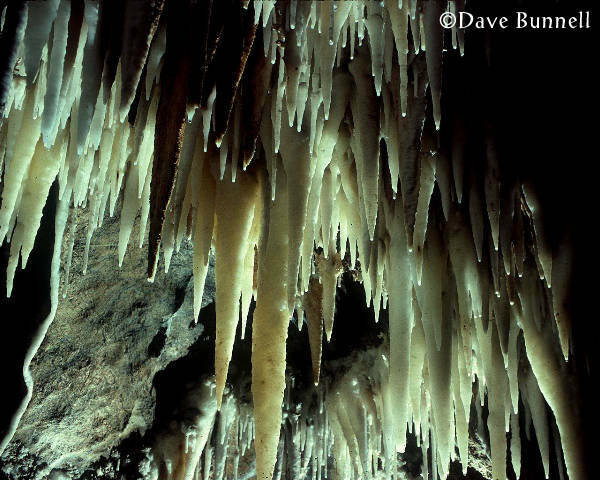 Like most caves, it had developed as water dripped through cracks in limestone. As the cracks widened, the rock was washed away. Tunnels, small rooms, and even enormous rooms developed. 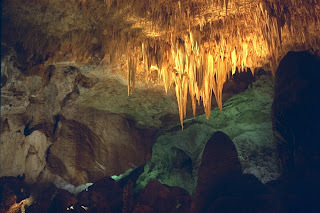 Jack asked why there were large, carrot-shaped stones hanging from the ceiling and coming up from the floor. 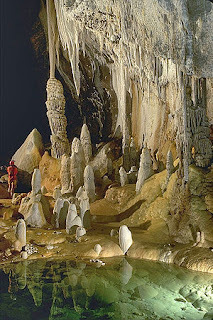 Jim explained that these shapes are often formed in limestone caves. As water drips from the roof, matter is left behind. In some places the drops of water hit the floor, and as the water dries, matter is left behind. From the matter in the water drops, stone pillars start to form. Sometimes their tops and bottoms grow large enough to join together and form a wall. A small stream flowing through the center of the chamber caught Anne's interest. Jim mentioned that it contained fish. He said that the skins of the fish were white. He added that the fish had eyes, but they were blind. This happened, Jim explained, because a cave did not have enough light for fish to be able to see. After many generations, fish could no longer see even when there was light. Many tunnels branched in all directions from this room, and Jim led the group to one of them. Anne stayed behind a moment, trying to see the fish with her flashlight. She yelled for everyone to wait, but no one heard her. The stream was too noisy. She quickly moved to a tunnel and ran inside to catch up with the others. She chose the wrong tunnel. When Jack discovered that Anne was not with the group, he turned back to find her. He, too, chose a wrong tunnel, and soon he was lost. Somehow, after an interval of about an hour, Anne and Jack found each other. In some ways they were fortunate. They still had water. Their flashlights still worked. Jack's lunch had disappeared, but Anne still had hers. They did not want to exhaust their water supply and decided to wait as long as possible before having a drink. They did not want to exhaust their flashlight batteries, either, and decided to use only one flashlight. They were too frightened to feel hungry. Yelling together as loudly as they could, they tried to attract Dad's attention. Both felt relief when they heard an answer. Their relief vanished when they realized it was only an echo they had heard. They walked for hours, searching for a tunnel that would connect with the chamber that had the stream. Jack and Anne were certain they could find their way from there. Finally they found a room that was even larger and more beautiful than the one Jim had shown them. But they were too tired to enjoy its beauty. First, Jack tried to convince Anne that they would be found. Then, Anne tried to convince Jack that they would be found. They took turns encouraging each other. Meanwhile, Dad and Jim had left the cave and gone for help. They were joined by many people willing to search for the lost children. After an interval of two days, Anne and Jack were found in the enormous chamber they had discovered. Not even Jim had known about this room. Television crews anxiously waited near the cave's opening. Anne and Jack had become famous during the time they were lost. The cave became more famous because of the newly discovered area. It began to attract more visitors. And, in honor of its discoverers, the new area became known as the "Anne and Jack Chamber." a. always colder than the temperature is outside. b. always warmer than the temperature is outside. c. always the same as the temperature is outside. d. about the same in summer and winter. a. bats are often found in caves. b. bats are never found in caves. c. bats are always found in caves. d. bats don't eat very much. a. it is cold inside caves. b. it is dark inside caves. c. matter is left behind by water drops. d. stones can be found in many places on the earth. a. do not have eyes. b. have eyes, but are blind. c. see very well in the dark. d. can only see when there is light. a. her shoelace was untied. b. she was frightened by the bats. c. she was tired of going through tunnels. d. she wanted to see the fish. a. their Dad found them in an hour. b. they had a good supply of food. c. they liked to explore caves. d. they had flashlights, water, and food. a. they heard an answer. b. there was only silence. d. they heard an echo. a. they did not stay with the group. b. the stream made too much noise. c. their flashlights didn't work. d. they decided to explore on their own. c. "Jim, the Cave Guide." a. two children who got lost. b. the animals found in a cave. c. what a cave looks like. Video of Luray Caverns in West Virginia.